The possibilities of using chitosan and its composites with transition metal oxides for arsenic removal from solutions with low concentrations are discussed. Methods for the formation of composite sorbents based on chitosan and molybdenum in a composition with a carbon fiber providing improved physical and chemical properties with respect to the recovered component are considered. 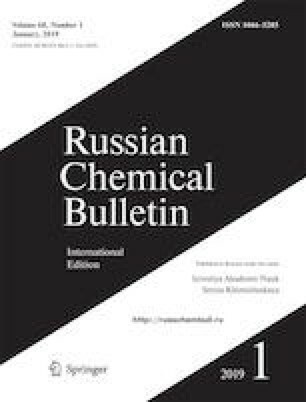 The sorption properties of the obtained materials under dynamic conditions for the purification of solutions from arsenic are compared. It is shown that the preliminary modification of the carbon fiber with chitosan by ionic gelation using sulfate ion and then by adsorption with molybdate ion leads to the production of an efficient sorption material that provides the purification of 1600 column volumes of an arsenic solution at an initial concentration of 105 μg L–1 to a maximum permissible concentration of 50 μg L–1. The calculation methods show that the gel ability of sulfate and molybdate ions is approximately the same. Published in Russian in Izvestiya Akademii Nauk. Seriya Khimicheskaya, No. 1, pp. 0009–0016, January, 2019.